Hair bows are right on trend, create fun accessories that can be worn with any length of hair and can be made at a fraction of the price of store-bought equivalents. The best part is that they don’t have to match whatever outfit you’ve chosen to wear on a particular day. They’re easy to make and have no limitations when it comes to how creative you can be. Here are just 5 examples of how to make a hair bow out of ribbon which tops our list of favorites. What could be more feminine than lace and pearls. And, yes, ribbon does come in fabric as well as lace versions. It also comes in beading. This hair bow is easier than imagined and you can make it in any color combination. Rolls of cloth ribbon 2″ wide in 2 colors. These can be any colors and/or patterns. 1 roll of 4″ wide lace ribbon with trimming on both edges. 1 roll of pearl beads in white, antique white, cream or black. Hot glue gun and glue tube or E6000 Fabric and Craft Adhesive. Cut lengths of fabric ribbon (3 in each color) into 6″ pieces. Fold each piece in half and tack it down with your needle and thread. Take 3 of the same color. With 2 pieces make a V overlapping slightly then lay the third piece in the center. Adjust them so they are equal distances apart then tack them so they stay together. Do the same with the other color. Overlap one color over the other 1/2″ in the center then sew all pieces together. You have just finished the 2 color bow. Cut the 4″ piece of lace into a 4″ length. Turn the raw edges under 1/8″ and glue down. When dry, lay the lace on top of the colored bow and center it so the fabric colors stick out at each end. Sew across the center and secure with a knot on the back side. Take the pearl ribbon and cut a length that will allow it to wind 6 times around the center after it is cinched. It should begin and end at the back. Wind the pearl ribbon around the center. Pull it tight so the bow cinches in the center. With the bow laying face down on the table, tie off the pearl ribbon by making a cinch knot around a pearl then winding it around a pearl on the other end of the string tying it off with a cinch knot. Tie the two ends together and knot then glue in place. When dry, open the barrette and tie it to the ribbon at each end and in the center. Make sure you go around a couple of times before tying it off in order to make certain it’s secure. There’s nothing quite like supporting the home team with a bow in team colors accented with glitter. Whether you’re into softball, baseball, football, soccer or one of the many other competitive sports, you can demonstrate your support by wearing their colors. A 2-sided ribbon 3″ wide in the team colors or a single color trimmed in a 2nd color. A thin ribbon in the color of the glitter. Cut the ribbon 15″ long. Holding the center, fold the right side toward the center making the folded end and tail of equal lengths. Move your thumb over the center to hold it securely. Secure all the pieces in the center by stitching 3 or 4 times then tying it off with a knot. Cut the thin ribbon 5″ long. Thread it through the pony tail holder and lay both down on the table flat. Place the bow on top making sure the thin ribbon is centered in the middle of the bow. Bring the two ends up and tie a knot on the front cinching it tight. Wrap the two ends opposite ways to the back feeding it through the pony tail holder and make another knot. With the threaded needle, sew basting stitches through the knots on the back and tie it off. Cut the excess ribbon off. With the glitter glue pen, have a good time either highlighting competitive sports like baseball, basketball, soccer, etc. or a specific team. This hair bow is a little more complicated so remember as you work on it that anything goes and you’re only limited by your imagination. It’s one that’s definitely on the funky side so have fun. Ribbons – Select a variety of patterns in similar colors in sizes ranging from super thin to 2″ rolls. Select various types of trim and embellishments. 1 French barrette. This type of barrette has 3 pieces (front, back and middle sections). Hi-Temperature glue gun with glue sticks. A lighter for sealing the ends of the ribbons. Decide the sizes and colors of ribbon you want to use. Cut the ribbons into various lengths based on how tall you want each bow loop. You have a choice of using 7 types of bows: loop & tail, just a loop, loop & 2 tails, just 2 tails, just 1 tail and korker. Use the formula (Tail length) + (Loop height x2) + (Tail length) = Ribbon length. For example, if you want loops in 2″ heights then you would have 2-1/2″ + 4 + 2-1/2″= 9″. Mark the ribbons on both tails. For 7″ and 9″ lengths place marks at 2-1/2″ and 6-1/2″. Take a 7″ long ribbon to make a Loop & Tail. Place the needle through the middle part of the ribbon at the marking on one tail. Pull the needle and thread all the way through until the knot stops at the back. Place the ribbon directly on top of the barrette after it has been opened and the center bar has been removed. Wind the needle and thread around the ribbon and barrette. Pull the thread tightly while squeezing the ribbon together on top of the barrette so it doesn’t fold over the sides of the barrette. Wind the thread around a few times. Take the other tail and, using the marking as a guide, place it on top of the barrette. It will look like a loop that stands up on its own. Place the needle through the center of the ribbon at the mark then pull it all the way through until the knot stops at the back. Pull the thread all the way around the ribbon and barrette a couple of times. Pull it tightly making sure to squeeze it on top so it doesn’t fold around the barrette. Take the 9″ ribbon to make a loop with 2 tails. Use the markings as a guide to place the needle each time and angle the ribbon a little so it doesn’t line up exactly with the last loop made. Add the remaining pieces of ribbon following the previous steps until you reach the end of the barrette. Start at one end of the bow and add additional loops working your way to the other end being sure to insert the pieces in-between the other loops, securing them with the thread wrap technique and angling them slightly so they are not lined up. Be sure to vary widths, patterns, colors, etc. Remember that you want to make it look funky. To add strips use korkers and thinner pieces of ribbon in 3/8″, 1/4″, 5/8″, etc. until the desired look is achieved. Add trims and other embellishments as desired. Cut a piece of 3/8″ grosgrain to fit inside the barrette and glue it in place. It will cover the threads across the underside of the top of the barrette. Replace the metal center piece removed originally and call it done. Whether you want something special for Easter or you have a little one that’s really into bunnies, this pattern will be the perfect fit. Just be patient with yourself and keep the look of the bunny in mind as you’re working with your ribbon. 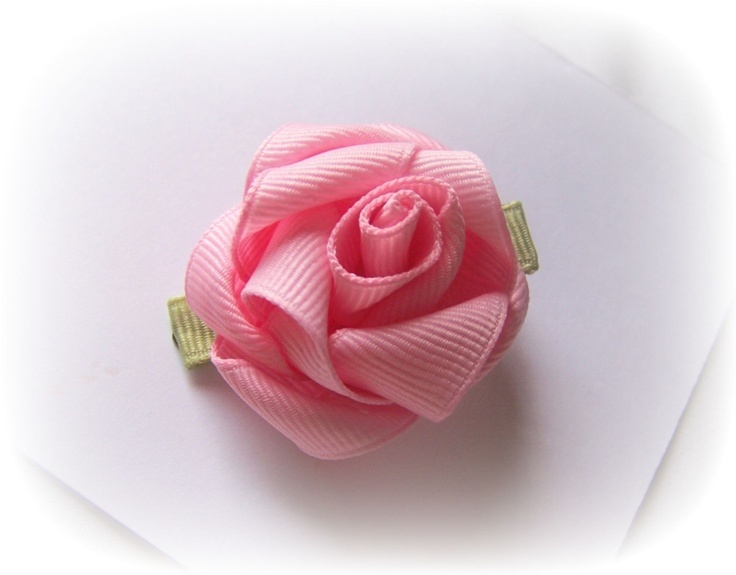 Hair bow hardware such as a pony tail band, barrette or alligator clip. Lighter to seal the raw edges of the ribbon or clear nail polish. A package of floral pearl stamens. Black paint and a fine line paintbrush. 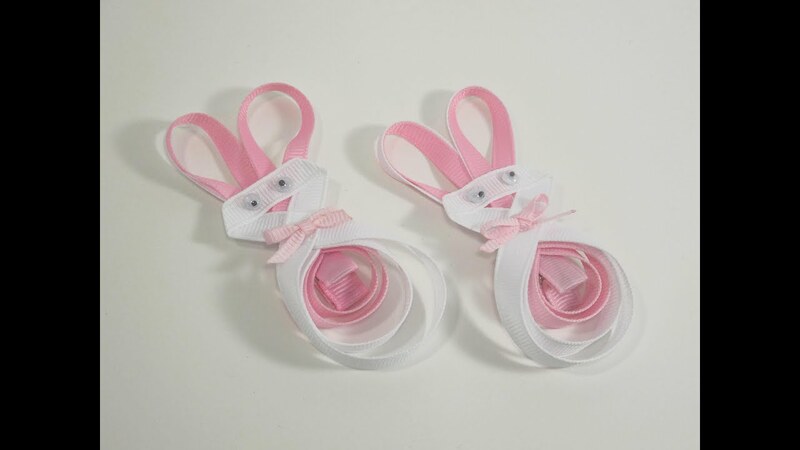 To make the bunny ears cut (2) 9″ ribbons – one in white and one in gingham – and stack one on top the other. Make loops on both sides overlapping them in the center. With the needle and thread, tack the loops in place.To make the bunny’s head and body, tack a 12″ piece of white ribbon on top the stitches of the ear loops. Make a 2-1/4″ loop at the bottom, a 1-1/2″ loop at the top and a 1-1/2″ loop at the bottom. Leave the small tail on the face as it will be used later. Tack the loops in place then wrap the thread several times around the center securing it with a knot. Attach the bunny to the hair hardware by winding the thread around the band or clip several times then tie it off. Tie a finishing ribbon around the center to cover the stitches and tie it off in the back. To make the face, take the white loop in front of the ears and glue it to the sides of the ears to form a triangle. Pull the tail remaining in front of the loop forward and glue the pearl stamens on the inside. The stamens make the whiskers. Roll the tail up in place, tack with the needle and thread and tie it off securely. Glue the rhinestone in the center of that piece. It will serve as the nose. Glue the 2 pearl beads on the upper flat sections of the upper loop and put a dot of black paint in the center of each.They serve as the eyeballs. As you get better, you can make it with various widths of ribbon, attach it to other bows and add embellishments that make it even more fun and funky. You can also make other animals utilizing a similar method. Flowers are very popular and roses are one of the best. With a little practice you can attach them to barrettes, alligator clips or even a headband. When roses are attached to a headband, however, it evokes the emotions felt when walking through a garden. Plus, it’s not that difficult. 2 rolls of silk ribbon in a color such as pink, antique white, baby blue, red, etc. 1 roll of green silk ribbon or silk leaves from the floral department. Needle and thread in the same color as the ribbon. Hold the ribbon in the right hand and fold the left side down. Roll the right side up and over the fold and tuck it in. You should have a bud. With the bud in the left hand, roll it toward the right 1/2 until you have 5 rows. Periodically, roll the edge down a little bit. With the needle and thread, run a couple of stitches through the base. Roll a few more times rolling the edge down a little bit then secure it with a stitch. Roll it the final few times rolling the edge down and secure it with the needle and thread then knot the string and couple of times. To make the leaves, cut triangles from the green silk. The pieces need to be big enough to stick out from under the rose when attached underneath. Run a basting stitch along the long side and pull it tight to curl the leaf. Repeat 3 more times then attach with the hot glue gun for the leaves. Each rose should end up with 4 leaves. An alternative is to buy leaves from the floral department at the local store and just use those by attaching them the same way. Continue making roses until you have a sufficient amount to fill in the part of the headband desired. Apply a small strip of hot glue to the headband and begin wrapping the ribbon that’s the same color as the roses around the band tightly making sure to leave a 1/2″ tail that can be tucked later. Make sure that the distance between each wrap is consistent. Continue applying a small strip of glue and wrapping the ribbon around the headband until you reach the other end cutting it off after leaving a 1/2″ tail. At the beginning, take the tail, roll it up and toward the back and tuck it into one of the wraps. Run a stitch through it and tie it off to secure then apply a dot of glue on top in order to seal it. Decide how you want to apply the roses. You have many choices such as offset on one side and clustered, clustered in the center, spread out evenly across the entire band, etc. Run a stitch through the leaves and base of one rose, push it tight against the band then run a stitch under the wraps and back through the rose. Repeat several times until you achieve the desired look. Other embellishments can be added as well, although not required. Pearls, stamens, baby’s breath, tulle and many other decorations will only add to the look. How to make a hair bow out of ribbon can range anywhere from easy to difficult but is well worth the effort. Whether making it for yourself or someone else, it will be a showstopper when seen in public. Plus, it’s right on trend. Do you have a better way to make your favorite bows? Sharing your tips, tricks and techniques would be greatly appreciated.